The High Court has dismissed Anglo Irish Bank chairman Seán FitzPatrick’s application to permanently prevent his trial before Dublin Circuit Criminal Court from proceeding. However Mr Justice Michael Moriarty on Saturday ruled the trial of the retired banker should be put back by just over seven months to May 2016, because of adverse media publicity about Mr FitzPatrick. Mr FitzPatrick, who is facing a number of charges including making a misleading, false or deceptive statement to auditors and of furnishing false information from 2002 to 2007, had claimed he could not get a fair trial due to the large amount of adverse media coverage about him. 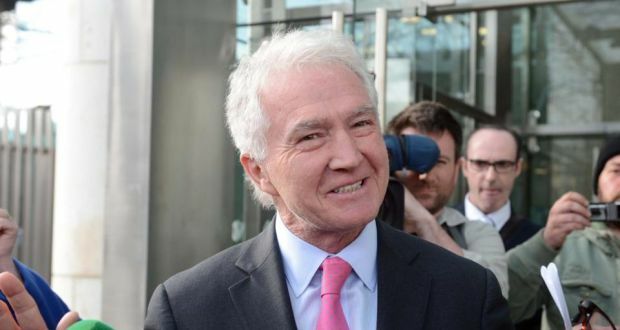 Mr FitzPatrick, who has pleaded not guilty to 27 charges under the 1990 Companies Act – made the application due to concerns over the large volumes of adverse media publicity he received following a recent, separate trial of three Anglo officials. His trial has been scheduled to begin on October 5th. He asked the High Court to make an order permanently prohibiting his trial. In the alternative he seeks an order quashing and decision of Circuit Court Judge Martin Nolan to refuse to adjourn the trial. The DPP has opposed the action, rejected claims Mr FitzPatrick could not get a fair trial and argued that the trial should proceed in October. In proceedings against the DPP Mr FitzPatrick (66) sought orders preventing his prosecution from continuing. He also seeks to quash Judge Nolan’s ruling in early August that the trial should proceed in October, after he rejected an application made on behalf of the former banker from Greystones, Co Wicklow for an adjournment. He further sought a declaration from the court that allowing his trial to proceed is contrary to the concept of a fair trial under Article 38 of the Constitution. Mr Justice Moriarty said he had considered all the matters urged on both sides in yesterday’s hearing, together with the written submissions, authorities and “as much of the daunting volume of documentation”, primarily copies of media reports as was possible in the limited time available. He said prosecuting council Paul O’Higgins SC was disposed, and he thought properly so, to accept that the court was entitled to appraise “the entire spectrum of the material events in the context of the overriding entitlement of Mr Fitzpatrick to a fair trial pursuant to Article 38.1 of the Constitution, which it was agreed must prevail over other possible competing rights. The primary and most dramatic relief sought by the applicant was that of an injunction to halt the trial permanently, or to impose a permanent stay on its continuance. “This, it seems to me, was a prudent change of course, as from both the facts of the case, and the substantial volume of relevant authorities cited, I am absolutely satisfied that it would only be in the most extreme circumstances that so drastic a form of relief could be acceded to, in effect aborting a highly significant prosecution brought by the respondent on behalf of the Irish people, and that all that has emerged by way of fact or law in the present instance falls far short of warranting such relief,” the judge said. The judge said one might also wonder how the three defendants recently tried, convicted and sentenced, or indeed the public at large, would view such disparate treatment. This portion of the relief sought, in all its forms in which advanced, must clearly be dismissed. A lengthy adjournment was not a remedy to be acceded to glibly, or on anything short of exceptionally compelling circumstances. He said he had endeavoured to read at least a significant cross-section of the vast number of press cuttings and documentation of radio and television coverage running to some thousand pages at least, even without reference to websites and other forms of communication. He had found the comparatively recent judgment in the Breifne O’Brien case of much relevance and assistance. The judge also referred to the recent sentencing hearing of the three former Anglo officials sentencing hearing after an overnight remand in custody. “As a casual observer, with no premonition I would be dealing with this issue within about a month, this I acknowledge engendered in myself, particularly in regard to the lady defendant, immediate feelings as a member of the public who had read the press coverage of the trial in general terms, feelings that were not favourable to Mr. Fitzpatrick,” he said. “I stress that, in this unusual observation, I am in no sense seeking to be in any way critical of the learned trial judge in that instance, or indeed of Judge Nolan, who presided in a difficult case with much courtesy and competence). Of course it does not mean that all antipathy to the applicant will have subsided when the trial re-starts, but I believe some particular elements are likely to have subsided by then. Having carefully considered competing factors, I rule that the trial should be adjourned to May 25th, 2016 the first day of next year’s Trinity term, and a deferral of little over seven and a half months.